City Councilor At-Large Ayanna Pressley ran unopposed for the 7th Congressional District in Massachusetts. So, the Boston City Council decided to celebrate her victory in its chamber, today, right after the midterm elections were over. Pressley is the first black woman to be elected to the House of Representatives from Massachusetts. The meeting was not all congratulations, however. Pressley spoke in support of many orders at the meeting, namely those about trauma and helping the elderly. 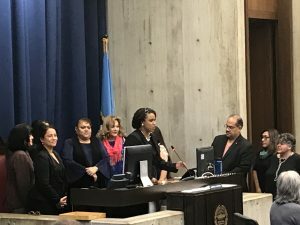 One of the dockets provided funds to be used in “allow[ing] the elderly to live and age in community and place where they grew up and with the families they love,” according to Pressley. Another docket dealt with a grant to help those with Alzheimer’s, working to end the disease and provide travel companions to seniors afflicted with the condition. Pressley had helped create the Committee of Healthy Women, Families, and Communities so she talked about the issue of trauma and how listening only hearings have been helpful. They let families share their experiences with violence and trauma, especially in losing loved ones as a result of gun violence. This led to making a Mass General Hospital bereavement room to gain a greater understanding of non-gun related violence, namely stabbings and other kinds of knife use, according to Pressley. “I’ll be here for a little bit longer,” Pressley promised before sitting down one last time at the meeting.